I was fortunate enough to hear Pete when he dropped by to play several informal concerts at the high school I attended during my sophomore and junior years. Not even really “concerts” – they were too informal and intimate for that. He sat on a folding chair with his banjo and sang, talked, joked and got us to sing along. It should be clear to those who read this blog that I am not the sing along type, but it was different with Pete Seeger. He had a presence, an authenticity, a naturalness that won us over. He was instantly “one of us,” and this in an era when we said, and really believed, “Never trust anyone over 30.” We had seen betrayal. We knew what it looked like and felt like. But Pete was one of us. “We’re all in this together,” he seemed to say, “as brothers and sisters.” You wanted to sing along, be part of a moment like that. Just “small events” that I’ve never forgotten. The memory jumped to mind when I heard that Pete has moved on from this world. Our good fortune is that he gave us so many anthems to remind us that we are still in this together. 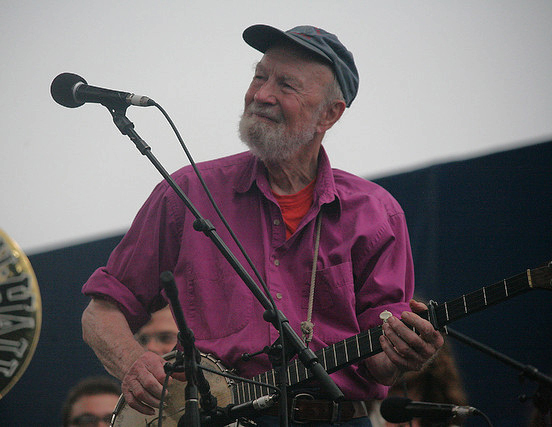 This entry was posted in Music, News and tagged 2014, Music, News, Pete Seeger. Bookmark the permalink. What a treat that must have been for you Morgan! I, too, am a big fan of Pete’s and was most fortunate to see him and Arlo in concert at least 4 times back when I still lived on Long Island. He really was a huge contributor to story telling and also to many community efforts to clean up the Hudson river. What a wonderful man who really walked his talk. I got to see Arlo a few times during the 80’s and early 90’s when he was touring more. A smallish theater downtown. He’s another great showman, and it must have been really fun to see the two of them together. I met him once in Poughkeepsie when he was leading an effort to clean up the Hudson. It’s a funny story I’ll tell you sometime over a cuppa. Thanks for this nice and very appropriate post. Nice. It was in Poughkeepsie that I met him too, and he was sailing up and down the river on his cleanup mission. An exemplary life, I believe. Great – thanks for the link! He’s gone to join that great band in the sky: John Lennon, George Harrison, Elvis Presley, Jim Morrison, Janis Joplin, Peter Cetera, Phil Everly, J.J. Cale, Karen Carpenter, Roy Orbison……………..just too many to name them all……………..but the band is the greatest in the universe!